Outdoor Hockey Rinks Have Major Benefits! Getting in ice time isn’t always easy when you’re a hockey player. Local arenas are usually meant for team practices and there isn’t a lot of time for individual players to find time to hone their skills by themselves. When you’re young, there’s nothing more important than finding time to practice puck- and stick-handling, individual moves on your skates and just taking shots at the net. As you get older and start to play pick-up hockey, you get fewer practices in because you’re not on an organized team. Research has shown that an average hockey player only gets 20 seconds of puck possession for each game. Some players only get a shot at the net once every two games. Therefore, the more training you put in, the better you will be. Practice makes perfect after all. 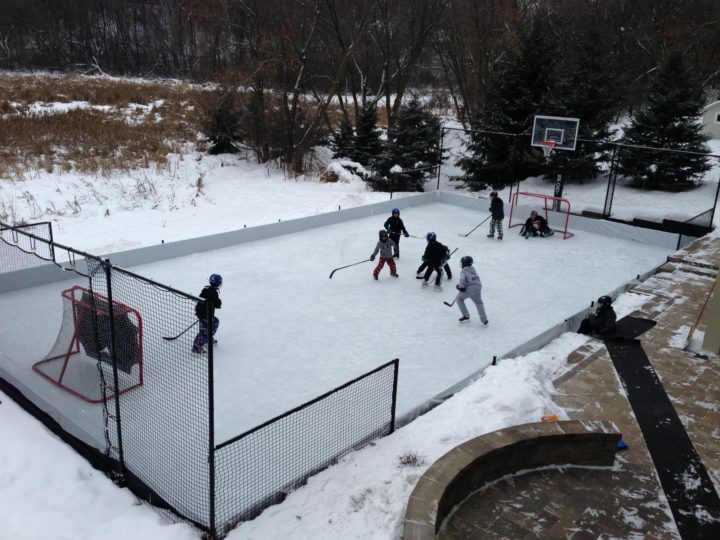 One of the best ways to find open ice time is to make an ice rink in your own backyard. With a Sport Court game court, you can flood and freeze the perfect area for an outdoor rink. Sport Court carries all the essentials that you need and we can help you out in the process. Families usually find out that home rinks are worth the cost right away. Not only do they help their children get in that much-needed ice time, but the rink serves as a gathering place for the neighborhood. Not only do the kids get to play hockey in their backyard, but they can invite their friends and teammates to play along with them. The health benefits of ice skating are also great. It’s a lot better than sitting inside and watching television! Ice skating can help with stability, control, and strength for players of all ages. It also improves joint flexibility, builds leg muscles, helps with weight management and increases endurance. Ice skating burns between 300-650 calories per hour, depending on how hard you skate. By having a backyard rink, you can establish a tradition in your community and neighborhood for years to come. The weather is cold in Minnesota and Wisconsin from December through March. Taking advantage of those frigid temperatures while also having fun in the process makes perfect sense. To find out how Sport Court can help you set up an outdoor hockey rink, call Sport Court North or Sport Court Wisconsin at 888-925-4667.